Apple has just approved the latest update to MLB's iPhone app which now enables any user to pay $0.99 to view any out of market game live on their iPhone. The update to the MLB At Bat app is now live in the iTunes store (version 1.4.0) and available for download. While some might wonder if this new pay-per-view service will also be rolled out to the PC, MLB said the new offering is only slated for mobile devices. In addition to the new pay-per-view functionality, the updated app also includes the ability to deliver customizable push notifications for when games start and end. The live video streaming is being delivered by Akamai and MLB says to date, they average about 25,000 live streams a day, total, not simultaneous. While that may seem like a low number, keep in mind that the ability to see up to fifteen live games a day was originally only being offered to iPhone users who had a MLB.TV subscription. This new pay-per-view service now opens up the live streaming of all non-blackout games to everyone. While live video streaming is cool, it was no surprise to hear MLB say that the live audio streaming, delivered by Limelight, is one of the most popular features in the app, since the live audio streams are not subject to any blackout restrictions. 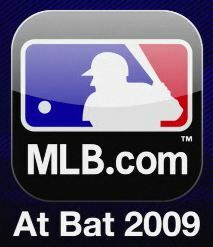 In addition to these latest updates to the MLB At Bat 2009 app, MLB said that come the postseason, MLB will introduce Quad View within the app, allowing users to view up to four different live camera angles on one screen with nat sound.